Cupcakes 'n Daisies: A Quilter's Tale . . .
Once upon a time, there was a quilter who wanted to make a basket quilt. This quilter loved so many basket quilt patterns that she just couldn't pick one, but every year, at the top of her Quilt To Do list was "1. Basket Quilt". Laundry Baskets from Fresh Vintage 14 by Fig Tree. The quilter ordered some Fig Tree fabric and started making baskets. and looked more like ice cream sundaes. sashing and cornerstones to the setting triangles on the basket blocks. Now most quilters would have been happy to slap a few borders around those adorable baskets and call it done, most quilters, but not this quilter. Happy with her choice the quilter set out making lattice blocks. it looked like this! It had a 2 1/4 inch gap between the baskets and the lattice!! Oh no, what's a quilter to do. Well after blogging about it, and trying every possible combination that was suggested, the quilter decided to cut her losses, and quit!! A summer's work down the drain, no basket quilt, no finished project for her lifetime quilt list. 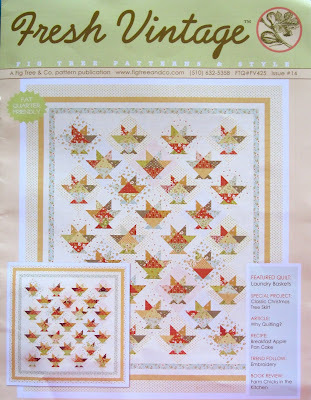 Every now and then the quilter would lament on her blog of her disappointment of not finishing the lovely basket quilt. And fellow quilters would try to cheer her up, leave words of encouragement, and keep offering suggestions. And then, after whining about this unfinished project in her Year in Review post, the quilter decided to just slap some borders around the baskets and make another quilt out of the lattice blocks. That wouldn't be so bad, to start making one quilt and end up with two quilts! Then a friend sent a new suggestion, which led to a different idea, which led to this. Finally, can you believe it, A la Mode is done! Don't you just love a story with a happy ending! This is Lifetime Quilt # 65, it finished at 109" x 109", and has approximately 2,397 pieces. I could not be happier with that inner border, I don't even think it's noticeable, your eyes just pass right over it on the way to the lattice border. And as good as this quilt looks in this picture, it looks even better in person. Thanks to everyone for your words of encouragement and suggestions, you just wouldn't let me give up on myself or this quilt! I adore this quilt! I seriously need to make that basket quilt! The lattice border makes it stunning! I'm glad you found a solution that made you happy. I'm SO glad you found a solution! What a beautiful quilt and what a story! You'll think of it every time you set eyes on that quilt...and probably every time you hit a setback in any of your quilts from now on, lol. Absolutely beautiful. Aren't you glad you waited until you "saw" the right solution? You've added some very beautiful touches to the pattern. It's wonderful, wonderful, wonderful...I'm so glad you didn't give up. I love it! What a perfect solution and gorgeous quilt. Thelma, this is just gorgeous! You let it "age" and voila! It became what it was meant to be. Some quilts just have to evolve, I am convinced of it. Thank you for sharing this evolution. Just like a fine wine, it was ready when it was ready!! Bravo to you! Wow! It turned out gorgeous! Thelma!!! My glory girl, that quilt is just totally awesome! I'm in awe of the choices you made along the way and how you took those basket blocks and came up with the finished layout. I love everything about it of course but you have to know...I would have stuck to the original plan and never jumped out of the box like this..Thanks for inspiring me! Sheer perfection and inspiration~ and what a simple solution! I'm so glad you couldn't leave well enough alone, and I'm sure you are as well! I enjoyed reading your fun quilt story on this snowy morning! And how fabulous that the story has a happy ending! Truly...that is the perfect border and the quilt is fabulous! I'm so happy for you that it is finished because you put so much time, work, and thought into this quilt. It is gorgeous. I'm so glad you persisted until you came to a happy ending. I love the lattice border. I am so not creative when it comes to borders; I will def be keeping this in mind. Good job. It's beautiful, Thelma! I know you're excited and proud of your efforts and especially your patience. It's perfect. Congratulations on a terrific finish - what a great way to start off 2011 with Belle Meade and A la Mode. The quilt is perfect. I want it! It's my favorite of all your quilts that I've seen. Spectacular. It is gorgeous! Giving it lots of thought really paid off. Can't wait to see Belle Meade! I LOVE the way this quilt turned out. Whoever gave you that idea was a quilt genius! It really does look like you planned it that way all along. Sometimes you just have to quit working on things and wait for inspiration to hit. I'm glad you didn't give up on this quilt - it's beautiful. I'd say that this A la Mode quilt is a brilliant success. Bravo! Well, if that wasn't worth waiting for, I don't know what is! Absolutely gorgeous! I have checked back often to see the finished top! It is wonderful. Big enough for my bed too! Anytime you want to lend it out, let me know! How wonderful it looks! I'm so happy that you finished it and that you are happy with the results. Congrats on another job well done! I am once again in awe of what you can turn a simple little quilt into. This has got to be in your top 3 list of favorite quilts. It is beautiful! So glad you got it done and shared it with us. BRAVO! BRAVO! The basket quilt is amazing! I love it, the inside border was a perfect idea!!! I have been looking for my pattern like that since Dec. I hope I find it so I can make the baskets too... BUT I am no where brave enough to do the change-ups that you did! See? Waiting for the perfect setting idea made your quilt even more special. Congrats on your finish! Just love your story and find your quilt sooooo wonderful!! Thelma . . . I absolutely love it . . . love it . . . love it !! you are amazing the way you work things into something so much more than the original pattern . . . I hope someday to be brave enough to do the same . . . 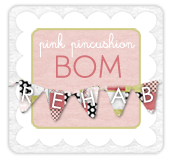 I am so happy I found your blog when I did . . . you help inspire me . . . a lot !! Smile...I always enjoy a happy ending. Oh my gosh....did this quilt turn out gorgeous or what? I have to say this is my all time favorite! Can't wait to see it quilted. Oh my gosh, the quilt is perfect. And that inner border. Your friend gave you some very good advice. Congratulations on a fantastic finish! Sorry you have so much snow there. Nothing here on the west coast (southern tip of Vancouver Island) yet, but it is very cold. The poor snowdrops are starting to wilt. Thelma this quilt turned out just gorgeous ! I just love the borders , just PERFECT!! Congrats on completing your BASKET quilt !!! Unbelievably gorgeous! Sometimes things are worth waiting for. Congratulation. Absolutely love it. Great job. Aren't you glad that you waited. It is one beautiful quilt. Nice job. Great idea that I just love very much. Looks beautifull. That is beautiful beyond words! Thanks for sharing all the pictures. Please take a picture when it is on the bed. Awesome!!! I'm so glad you stuck it out with the lattice border because it's just perfect! Thank you so much for sharing this story! 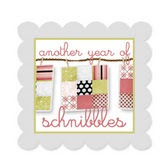 I love to see how other quilters change designs, and combining a desgin with a schnibbles is very clever! Not to mention that this quilt is totally amazing! The inner border looks perfect! I want to sit on this quilt and eat strawberries! Fantastic finish! I'm so glad you found the solution and were able to finish the quilt top in a way you love because it is very special. Love love love it! Now you can cross that one off your list. I'm sure you are thrilled with it!!! What a fabulous quilt! I'm so happy that you found a solution - I've been following the story of this quilt and love how it's turned out. Great story and wonderful quilt. I've had a couple that took a while to find their way to being a completed quilt. Sometimes it just takes time to pull it all together. What a spectacular quilt! It is simply gorgeous!! Amazing, fantastic, wonderful...I could go on and on...and yes I do love a happy ending!! I love this quilt. It has such a happy feel to it. I ordered the Laundry Basket Quilt pattern after seeing yours. Thanks for sharing this wonderful quilt. Yes, most of us would have given up....but not you! This quilt is stunning. I love it! Obviously this quilt just took a bit longer to "speak" to you. Well worth the wait - it is gorgeous!!! If anything that extra little border enhances it a lot. Oh my gosh! What a beautiful quilt. That's one of the prettiest things I've ever seen. I want one! The quilt is beautiful and I LOVE the lattice border!!! I do some of the same kind of quilting, glad that you did not give up. Also glad to know that our fellow bloggers are out there to help and support us. The quilt is gorgeous! I want one too! Wonderful story of a wonderful quilt! That's why we should never despair -- there is always a solution to a "quilt dilemma" because with a quilt there is no wrong way to go. Glad your quilt design muse led you to such a happy ending! It's sew perfect I am totally in love with this quilt!!! 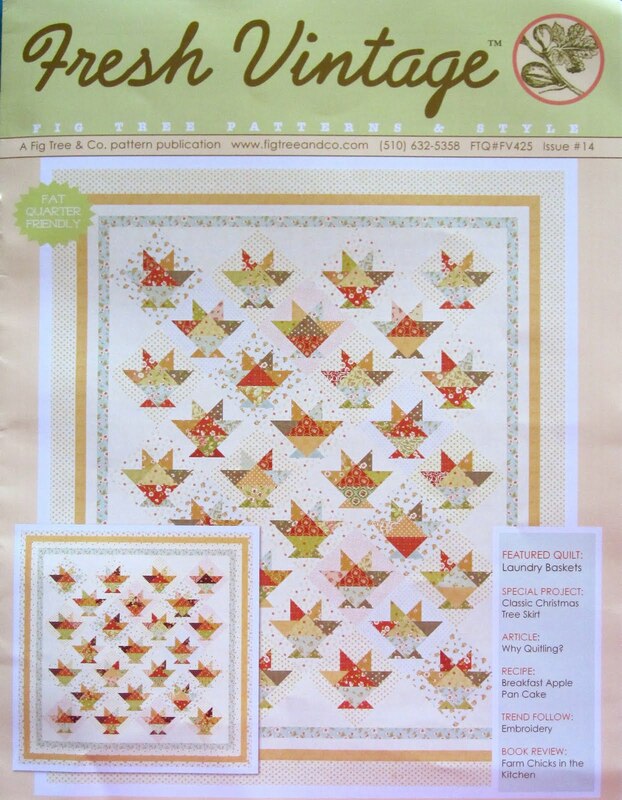 I too have been looking for the perfect basket pattern originally I wanted to make a mini basket quilt but maybe I will have to junt down pattern too! Thanks for the inspiration and I am sew pleased you've finished this quilt. Honestly, Thelma, I think I love every new quilt you finish more than the last -- if that's even possible -- and A la Mode is no exception! I'm so glad you persisted! Ok, I'm just so impressed.. Why are you not designing quilts and getting a publisher... You did awesome, dear... you should be pleased. What a great story and quilt!! Of course, I knew the story already since I read your blog regularly!! 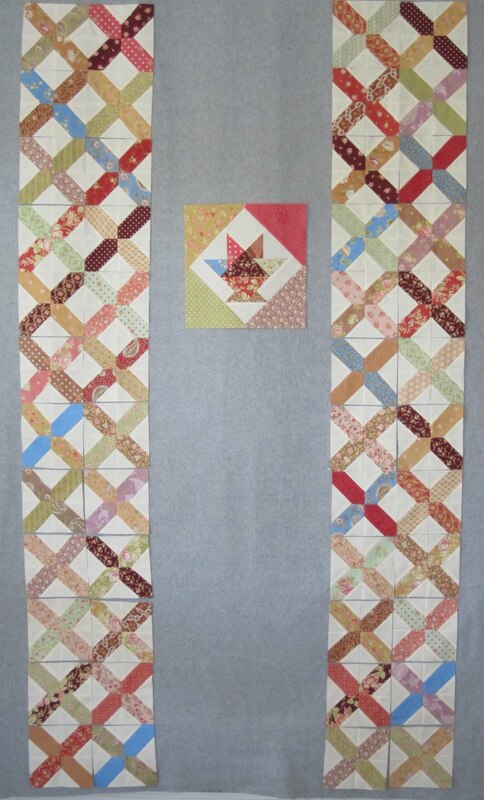 I just LOVE, LOVE, LOVE this quilt!! So glad you didn't give up!! Can't stop staring at this one. I'm in awe of your patience....and determination. It paid off in spades!!!! This one is a dazzler. absolutely stunning. you continue to inspire and motivate me to get projects finished. today I think I will work on a 'no mind'job a scrappy nine patch! That is the best Mash-up I have even seen! You Rock! Your quilt is absolutely stunning!! What size are the blocks? Ann, the basket blocks with the setting triangles finish at 11 1/2 inches!! I don't have your email address, hope you come back and check here for an answer!